On Tuesday, the Guadalupe council held a retirement ceremony for outgoing Public Safety Director Gary Hoving, formerly a longtime San Luis Obispo County Sheriff’s deputy. Later, the council met in closed session to discuss the potential hire of Michael Cash to replace Hoving. The matter was initially agendized as a public hearing on approving a contract that would give Cash a $98,000 base salary to serve as the city’s public safety director. Following public criticism of the move in the lead-up to the meeting, the matter was changed to a closed session hearing. On Tuesday night, after meeting for multiple hours in closed session, the council said no reportable action occurred. Cash formerly served as the chief of the Southwestern College Police Department. Southwestern College is a community college in Chula Vista. During Cash’s tenure as campus police chief, the college’s newspaper, The Sun, reported on a host of allegations levied against the law enforcement official, some of which appeared in lawsuits. The reports included allegations that Cash covered up sexual assaults, kept an inaccurate crime log and misused public funds. In an incident for which Cash ultimately apologized, the then-college police chief discharged his gun in the police locker room, causing a bullet to go through a wall and into an occupied room. Cash was reportedly taken to the hospital following the incident after he exhibited shock-like symptoms. It is unclear whether or not investigators determined the shooting to be accidental. Cash was placed on leave following the incident, but later returned to work and penned an apology letter to the college campus that was published in the Sun. Prior to serving as the chief of the community college police department, Cash worked for the San Diego Police Department, as well as for the San Diego Chargers. The Sun reported that the Chargers fired Cash following an incident in which players violated team rules. Before Tuesday’s meeting, Guadalupe Councilwoman Gina Rubalcaba defended the plan to hire Cash, stating on Facebook that it is frustrating people want to believe newspapers in an era in which reporting has become one-sided and opinionated, rather than factual. To the Citizens of Guadalupe, You are getting a great person to lead your Public Safety if approved. I have personally worked with Michael Cash for over 20 years. 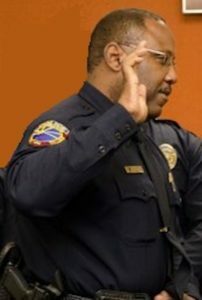 He is highly qualified to run a Public Safety Department and has demonstrated those qualifications in his previous jobs. Do not be mis-led by information found in the Southwestern College’s Sun newspaper. Do your own research. VERIFY before condemning this man. I guarantee, the City of Guadalupe will become a safer, more law enforcement friendly, partnership building, trusting community than you have seen in the past. Don’t believe the hype!!! Check for yourself!!! Guadalupe Cash has a synonymous ring. There’s a log in my eye. Oh well, I see a splinter in yours. $98,000 base salary p!us generous benefits… Sure sounds good! All this guy needs to do is stick around for a while & he’ll retire with a very nice pension. I give Mr. Cash two years–three tops–and he’ll retire…or go out on medical leave…or paid admin leave. Just wait and see. What is good. Not really associated with and police department that had to deal with street crime on a regular basis. Discharged his gun in a locker room, and then had to go to a hospital for shock like symptoms. This looks like and accident getting ready to happen along with some type of potential lawsuit in the making. He seems to be a perfect candidate: sexual assault, lying of crime reports, misuse of funds….accidental discharge of a firearm….fired by a sexist, all white male organization (the Chargers). He is perfect for the job and judging from his past experience he seems to be the sort of person who will “play ball” and help the right people….wink wink. Great article. Go ahead and read (click the hyperlink) “reported on a host of allegations….” and see how Guad could ever consider him as chief following Gary Hoving. They’d be back in the shoot ’em days of the ’70’s and ’80’s while the new chief search’s for new girlfriends and hires incompetent losers to run the city’s police department. Let’s see, sloppy work, cover ups, misuse of funds…sounds perfect!